Ran into a fun issue with vCenter 6.5 and a deployment of ISE. When deploying the ISE ova template we received a chunk size error: “OVF parameter chunkSize with value XXXXXXXXXX” is currently not supported for OVF package import. Thankfully a VMware kb article walks us through how to fix the issue. The first step is to unpack the ova file with a tool such as 7zip on Windows or tar on Linux/Mac. Depending on the version of ISE you’re deploying there should be a number of vdmk files. On Linux/Mac we can use the cat command to combine these into one disk file. On windows the copy command will accomplish the same thing. Next we just have to edit the .ovf file to point to the new disk1 we created. Open the ovf in a text editor and find the chunk size attribute. 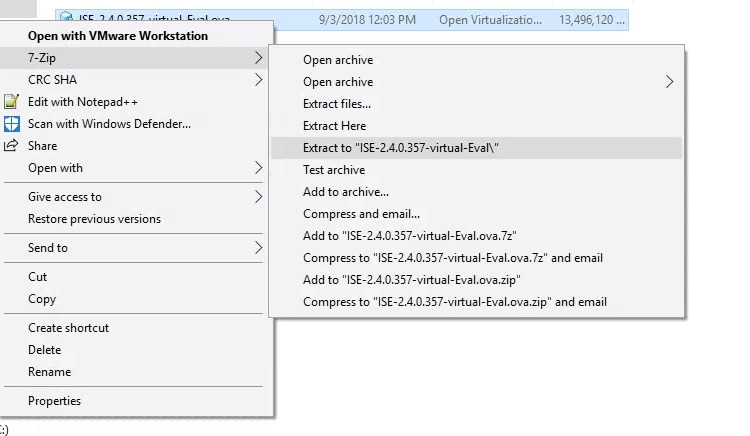 Deploy your edited ovf and you should now be able to proceed with the ISE installation error free.